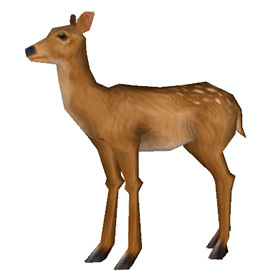 This pet is rewarded via the mail when your character completes the "Lil' Game Hunter" achievement. To complete this achievement, your character must possess at least 75 unique vanity pets. Upon learning your 75th pet, you'll immediately receive this pet in your mailbox, sent by Dalaran's vendor, Breanni. Restores 157 health every round for 5 rounds. @Cruelnetwork: The achievement that awarded this existed long before pet battles were added. There's nothing special about it because you couldn't catch other normal deer. How come Nature's Ward doesn't give you the Elemental racial? I just got this pet today by getting the 75 unique pets achievement! It doesn't come in the mail anymore... it just appears in your pet journal. I've had this pet for quite some time already, but I only just noticed that it has little holes in the ears and the holes seem to change places depending on if you look at the pet from the front or the back! It has magic ears! I have to echo everyone else's "I wasn't too excited about getting this for the achievement" sentiment, as well as the "once I saw it moving it all changed" they beautifully captured that wobbly awkward leggy gait of a fawn and it is so damned adorable bouncing around behind me when I'm mounted that it's become one of my favorites (next to Stinker). When I first hit 75 pets, I pulled this guy out all the time... to show off my new 75 pet status. But once I hit 80, 90, 100+ pets, he lost his luster a bit. He's still cute, and I do like his leaping run animation, but I wish I had a pet I could pull out when another player tries to have a pet-off with me that said, "OK I have pet X! 'Nuf said!" I'm thinking we won't get a 100 pet achievement. Too many mount collectors would complain. But here's to hoping the 125 or 150 pet is really cool!! I wasn't too excited about this pet, even though I was trying hard to get the 75 Pets achievement. I just wanted the achievement and thought the pet itself was pretty lame -- not nearly as cool as Stinker. That all changed when I saw him... with sweet sad eyes and an adorable face, he definitely stole my heart and became one of my favorites. His running animation is also pretty darn cute as he happily bounds along. This companion does not yet appear to do anything "extra" like the 50 pet reward, Stinker, does (chasing black cats). I sure hope they add a fun feature to this pet to make it worth our while for being avid collectors! She likes the company of friends. Seventy-five of them, to be precise.